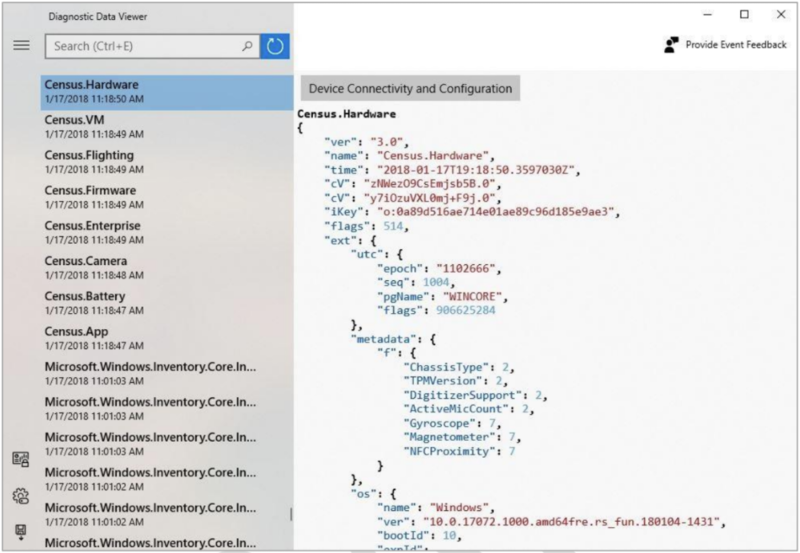 Microsoft’s and its partners’ engineers use the telemetry data from Windows 10 to diagnose crashes, learn about its users hardware configurations and more. It’s on by default and while Microsoft tells you that it collects this data and gives you a choice between basic (the default setting) and “full” diagnostics, it never allowed you to actually see exactly what was being sent back to Redmond. That’s changing now, though. Windows 10 insiders will soon be able to install a new program from the Microsoft Store, the “Windows Diagnostic Data Viewer,” that gives them full access to all the diagnostic data from their Windows device. As Marisa Rogers, Microsoft’s privacy officer for its Windows and Devices Group, told me, the idea here is to give users the option to see “that next layer of transparency from Microsoft” and allow them to verify that the company is doing what its documentation says. Users can download this free tool without the need for a Microsoft account. Microsoft itself, of course, has long had tools to view this data internally, but the Data Viewer tool puts a user-friendly interface on top of this data. Diagnostic level selection and so on. Product and Service Usage data includes details about the usage of the device, operating system, applications and services. While Microsoft hopes that this tool allows users to validate and verify what it has been telling them all along, it may still come as a shock to some people that Microsoft is collecting this data by default, even if it’s only technical data about their devices. “I hope that people have been paying attention to the messaging we have been providing over the last few month,” Rogers said. But outside of the world of Microsoft enthusiasts, few people are probably even fully aware of this telemetry program, so it’ll be interesting to watch the reaction. In addition to this new tool, Microsoft is also launching a small update to its Privacy Dashboard. Here, the company will now provide a news feed-like view of all the data it collects as you search on Bing, talk to Cortana and use other Microsoft services where you are an authenticated user. Until now, that data was organized into different categories and it was hard to get a quick overview of the activities the company tracked. The new so-called “Activity History” view makes that a lot easier.